The remains of Birsreshtho Matiur Rahman, one of the most valiant heroes of the Liberation War of Bangladesh, arrived at the Zia International Airport last night from Masroor Air Force Base in Pakistan. 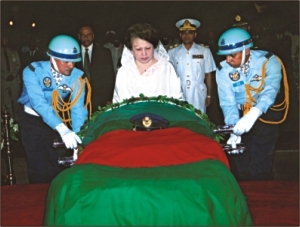 Prime Minister Khaleda Zia received the national flag covered coffin containing Matiur's remains at 11:00pm and paid homage by placing a wreath on the coffin after a special flight of Bangladesh Biman brought the war hero home. Martyred Matiur's family members including Milly Rahman, the widow of the late hero, and their younger daughter Tuhin Matiur Haider were in tears as they touched the coffin for the first time. Their elder daughter Mahin Matiur now lives in the USA. "I do not know what to tell at this moment but we are very happy that at last his remains are coming home, enabling people to pay homage to him," Milly Rahman said in a voice choked with emotion yesterday afternoon before going to the airport. Several cabinet members and government high officials were also present at the airport. As part of the highest state honour, the Armed Forces Division and Bangladesh Air Force coordinated the honour guard at the airport. A motorcade carried the coffin towards the Kurmitola Central Mosque of Bangladesh Air Force through Mohakhali Flyover and Shahid Zahangir Gate to keep it there overnight. State Minister of Liberation War Affairs Prof Rezaul Karim at a press conference yesterday said Matiur Rahman's elder brother Khorshed Alam accompanied a six-member government team to Pakistan to bring the remains home. "It took three hours to dig out the grave and process the remains of Matiur Rahman. Then it was put into the coffin to bring home," said the minister. The three wings of the defence forces, the Army, the Navy and the Air Force would pay the highest respect to the hero at the National Parade Square, he said. The minister parried the reporters' repeated questions about whether "war criminals" who are now cabinet members would be present at the programme. In the presence of the president, the Namaz-e-janaza of Matiur Rahman and a special prayer will be held at the National Parade Square at 10:00am tomorrow. The coffin will be kept there for sometime for all intending to pay homage to the war hero. Afterwards the remains will be carried to the Martyred Intellectuals Graveyard in Mirpur to bury with state honour. Motorcades will squad the hearse carrying the coffin. Building of a mausoleum will start just after the burial of the coffin, liberation war ministry sources said. Matiur Rahman was born on October 29 1942. He joined the Pakistan Air Force in August 15, 1961 and was commissioned on June 23, 1963. Matiur left Bangladesh for West Pakistan on May 7, 1971 with his wife Milly Rahman and two minor daughters, family sources said. "I knew about his plans to defect with an aircraft," Milly Rahman told The Daily Star. On August 20, 1971 Matiur Rahman piloted a T-33 trainer aircraft from Karachi, Pakistan, towards India in an attempt to defect from the Pakistan Air Force and join the Liberation War of Bangladesh. He couldn't complete his desired mission, as the plane crashed when the other pilot Rashid Minhas tried to prevent him. "I came to know about his death on August 21," Milly Rahman said. The family of Matiur Rahman came back home on September 29 in 1971, family sources said. Matiur Rahman was awarded the title Birsreshtho, the highest gallantry award for heroic achievement in the Liberation War. An air base in Jessore is also named after him.